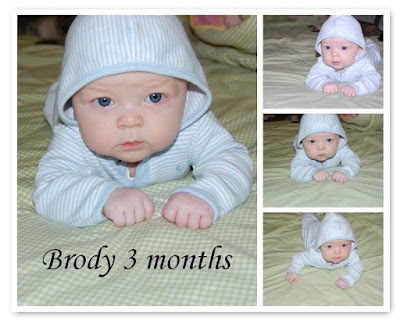 Brody turned three months old today! My little boy is such a happy baby! He is always quick to give me a smile. Every morning when I pull him out of the crib he flashes me a giant smile. Brody is constantly staring at his hands and trying to make them work. I think he will start grabbing things any day now. He loves his tummy time and has even rolled over a few times. He loves his singing story book, playing with daddy and looking at the computer. He would rather be sitting up on my lap then being snuggled. He always wants to look around and see whats going on. These three months have been great! I love my Brody boy so much! He is seriously soooo cute! look how big he's getting!! oh my goodness what a cutie!